Have you ever disagreed with a treatment decision involving a seriously ill or dying patient? Have you ever had to deliver care that you felt was inappropriate or even harmful, or been prevented from delivering care you knew would help ease suffering? Have you ever left work feeling you failed to do the right thing? If so, you have probably experienced moral distress. Every healthcare provider has a personal moral code, a set of values that works in conjunction with their professional duty to provide beneficial treatment, to do no harm, and ultimately provide the best care. When you participate in or observe situations that are in conflict with your own values, moral distress can occur. This eBook will help improve your ability to handle morally challenging situations in the workplace that can spill over into daily life. 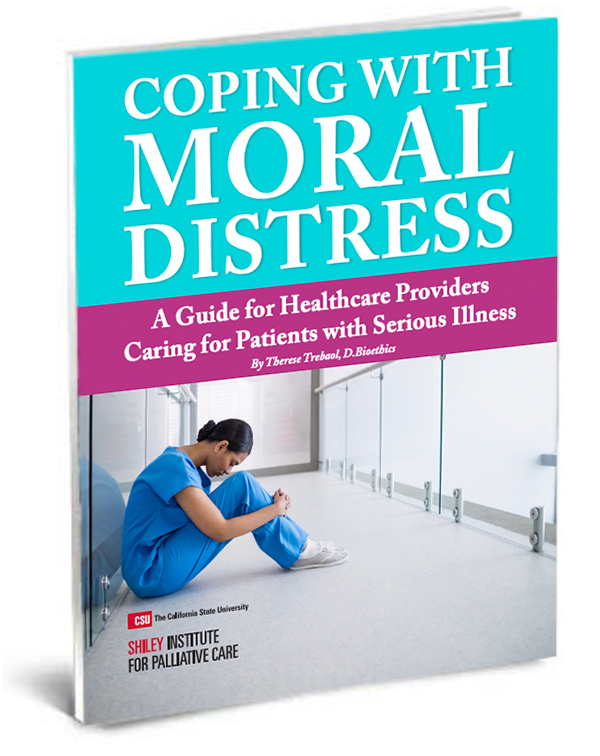 It delivers strategies that address moral distress and strengthen professional and personal resilience so the important work of providing all levels of care can continue. Respond to moral distress with personal and professional strategies. Cope with the challenges of future cases. Check out these courses that provide more strategies on avoiding burnout! This new course is all about self-care! Learn why building resiliency is crucial for people working in palliative care or hospice, and discover several techniques for incorporating self-care into your life and work. Self-paced, 2 CE hours. This course provides participants with an understanding of why visual arts are so powerful in healing, and how to facilitate others in exploring, through their own art and self-interpretation. Instructor-led, 24 CE hours. This course explores how health professionals can use essential oils to promote well-being and ease discomfort, for patients and themselves. Self-paced, 4 CEs. This is a comprehensive series of courses designed to provide foundational palliative care skills to any MD, PA, NP or other practitioner. Self-paced. 34 CEs or CMEs (full series); also available as individual courses.